At just 25, Rory McIlroy has secured his first Open Championship and third major title with a two-shot victory over Sergio Garcia and Rickie Fowler on a thrilling final day at Royal Liverpool. Starting six shots clear of the field, McIlroy fired a final-round 71 to finish at 17-under-par as Garcia, who got to within two strokes of McIlroy several times, shot 66 to finish at 15-under, alongside US Open runner-up Fowler who fired a closing 67. American Jim Furyk, 44, matched his fourth place in 2006 with a 65 to close the tournament at 13-under. Adam Scott secured another top-5 finish at a Major at 12-under following a final round 66 to be in a tie for 5th position with fellow Aussie Marc Leishman at 12-under-par. 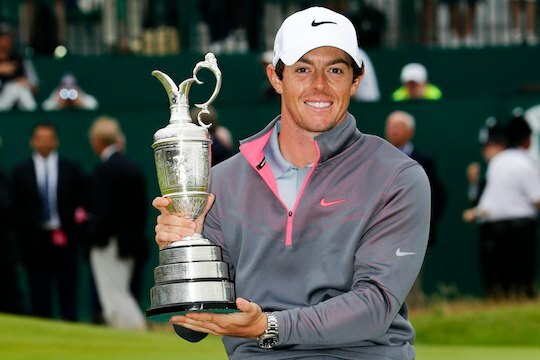 McIlroy added the Open Championship trophy – and a cheque for £975,000 (A$1,771,667) – to the 2011 US Open and 2012 US PGA titles and became the second Northern Irishman to win the Open in four years after Darren Clarke’s victory at Royal St George’s in 2011. “I never dreamed of being at this point of my career this quickly,” McIlroy said Sunday afternoon, with his 17 under for the week the fourth-lowest score in Open Championship history. “Looking forward to driving up Magnolia Lane next year,” said McIlroy with a smile. McIlroy’s birdie on the opening hole left the impression he was on another roll after earlier rounds of 66-66-68, but the odd nervous moment followed. Bogeys at the 5th and 6th halted McIlroy’s momentum a little, yet dual birdies on the 9th and 10th put him back on track. Another at the 16th would prove enough to see the Claret Jug within his sights. McIlroy was to stand on the 18th tee holding a three-shot lead, with García yet to make his birdie. McIlroy also held an iron and was playing for placement to secure the victory contrary to his fondness for aggression on the course. “I want to be that guy who wins majors regularly,” said McIlroy. McIlroy won’t overtake Adam Scott as the world’s top-ranked golfer this week as the rankings are based on a two-year average of results. McIlroy has been world number one for 39 weeks in his career, most recently in March 2013. McIlroy now becomes part of golf’s royalty, joining Tiger Woods and Jack Nicklaus as the only players to win three of golf’s modern majors by the age of 25.